TORONTO, July 5, 2018 /CNW/ - Nighthawk Gold Corp. ("Nighthawk" or the "Company") (TSX: NHK) (OTCQX: MIMZF) is pleased to announce drill results from the Leta Arm Project ("Leta Arm"). Twenty-two holes (5,169 metres) were recently completed at the Diversified deposit, as well as the Number 3, and Lexindin showings, highlighted by a new discovery at Diversified where hole DV18-08 intersected 17.50 metres of 5.81 grams per tonne ("gpt") gold ("Au"), including 9.25 metres of 9.65 gpt Au, and 4.75 metres of 18.12 gpt Au. Drilling has validated the northerly steep plunging mineralization model as being a common feature to the four Leta Arm prospects. Dr. Michael Byron, President and CEO commented, "Given our positive exploration results to-date, we are confident that the four Leta Arm gold deposits and showings are part of the same mineralized system as they share similar styles of mineralization, mineralized widths, general morphology, a common steep northern plunge, and are distributed along a linear array. We intend to continue advancing our understanding on the mineralization controls in this high-profile region and will broaden our exploration efforts along the 10 kilometres of mineralized stratigraphy in search of new discoveries. Leta Arm is just one of the many projects that we are aggressively exploring in 2018 and features prominently in our objective of realizing the untapped potential of this fertile gold camp." Leta Arm lies sixteen kilometres southwest of Nighthawk's Colomac Gold Project ("Colomac"), Northwest Territories, Canada (Figure 1) and straddles the Leta Arm Fault Zone ("LAFZ"), a north-south trending, well mineralized, regional deformation zone up to 10 kilometres long and 500 metres wide that hosts all four of the deposits and numerous gold showings. The four Leta Arm prospects were discovered in the late 1940's and early 1950's and are characterized by numerous high-grade vein systems developed within a 2.8-kilometre portion of the Leta Arm Fault Zone. Deposits and showings lie within a highly altered shear zone up to 500 metres wide hosting both parallel and extension vein systems open in all dimensions. A total of fourteen holes were drilled at Diversified (3,446 metres), six at Number 3 (1,294 metres), and two at Lexindin (429 metres), as presented in Table 1 below. Results for the North Inca deposit were presented in the Company's June 26, 2018 press release. * Lengths are reported as core lengths. True widths vary depending on drillhole dip; most holes are laid out to intersect the mineralized zone close to perpendicular therefore true widths are approximately 50% to 80% of core lengths. 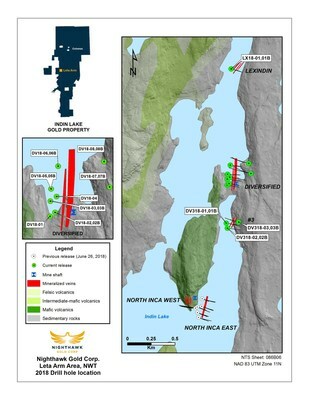 Details of the Leta Arm Gold Project are provided in Nighthawk's June 26, 2018 press release, along with results for eleven drillholes completed at its North Inca gold deposit. Leta Arm is comprised of two historical gold mines (North Inca and Diversified) and two high-profile gold showings (#3, and Lexindin), and populates a 2.8-km section of this 10-km-long, 500-metre wide north-south trending regional deformation zone. Exploration shafts and limited underground development were completed on the North Inca and Diversified gold deposits in the late 1940's and early 1950's exploring multi-stage quartz veins characterized by high-grade gold mineralization. The Diversified mine is 1.3 kilometres north of the North Inca mine with the Number 3 showing situated between them and the Lexindin showing an additional 1.2 kilometres north of Diversified (Figure 1). The four prospects form a linear array and remain open laterally and vertically, with recent drilling indicating that they may be part of a common, and extensive, but underexplored system. This area of the Indin Lake Gold Camp has been the subject of limited historical exploration despite the abundance of surface gold showings and shallow deposits (see press release dated April 12, 2018). 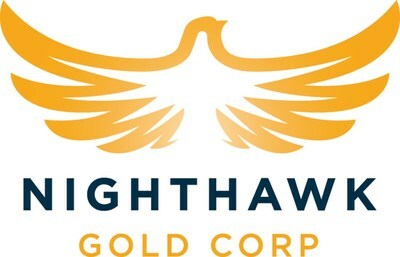 Nighthawk's 2011 and 2017 drill programs explored Leta Arm targets to limited depth and strike extent, yielding encouraging results including the recognition of significant mineralized zone widths, the potential for zone expansion, and the opportunity for new discoveries as drilling has not tested below 100 metres. Current geological modelling of the four Leta Arm prospects define a steep northern plunge to the mineralization which was used to generate drill targets for the 2018 drill program. Results from the eleven holes drilled at North Inca have helped validate the model and resulted in the extension of the East Zone an additional 100 metres south where it remains open (see press release dated June 26, 2018). The Diversified deposit shares similar characteristics to the North Inca deposit (see press release dated June 26, 2018), where several parallel north-striking quartz-rich veins occur within a highly strained contact zone between metavolcanic and metasedimentary rocks. The en-echelon nature of their veins suggests they may continue along strike and repeat to depth. Its "Main Zone" lies within metasedimentary rocks and has been traced by historical drilling and limited underground development for 220 metres. Nighthawk's 2011 drilling focused on validating the limited historical data on the near surface mineralization, to determine if gold extends into the surrounding country rock or is restricted to the quartz veins, and to explore the vein systems along strike and to depth. Results to-date have confirmed the deposit's high-grade nature, defined zone widths that significantly exceed those previously reported, and extended mineralization to new depths (see press releases dated June 15, 2011; September 6, 2011; and November 21, 2011). In 2018, fourteen drillholes targeted the steep northern plunge to the vein zones (Figure 1). DV18-01 drilled the southern portion of the deposit to probe the southern limit of a previous shallow intersection. Although mineralization was encountered 32 metres from surface, the hole did not extend the mineralization to depth. Holes DV18-02 and DV18-02B were collared 20 metres north of DV18-01 to explore the deposit down plunge to the north. Both holes encountered mineralization extending the zone an additional 55 metres to depth where it remains open. 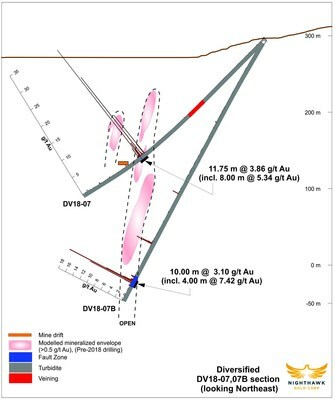 DV18-02B, the steeper hole, intersected new near-surface mineralization west of the Main Zone veins, returning 2.25 metres of 6.16 gpt Au, including 0.75 metres of 16.25 gpt Au. 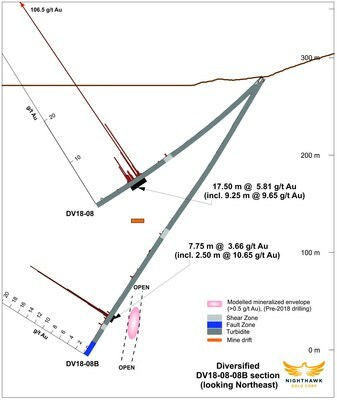 Holes DV18-03 and DV18-03B explored an area 65 metres above the up-plunge extension of the intersection reported in DV11-03 (see press releases dated June 15, 2011) and infilled a gap within the central portion of the deposit. DV18-04 was drilled from a lake setup 30 metres northeast of DV18-03 intersecting moderate mineralization and infilling a down-plunge gap in drilling between two zones. Two holes were collared 25 metres north of DV18-04 to continue testing the northern plunge control to mineralization and to address gaps in drill coverage. DV18-05 and DV18-05B were successful in linking the zone up-plunge, highlighted by DV18-05 which returned 11.75 metres of 2.57 gpt Au, including 4.25 metres of 3.80 gpt Au. Six holes were drilled from three setups along the northern down-plunge extension of the Main Zone. DV18-06 and DV18-06B were collared 90 metres north of DV18-05 and tracked the mineralization to 190 metres vertical depth, intersecting strong mineralization highlighted by DV18-06, the shallower hole, which cut 14.10 metres of 3.50 gpt Au, including 6.65 metres of 6.67 gpt Au. Holes DV18-07 and DV18-07B successfully traced the modelled plunge of the Main Zone to depth confirming its continuity. The shallower hole, DV18-07, intersected 11.75 metres of 3.86 gpt Au, including 8.00 metres of 5.34 gpt Au, and 4.25 metres of 8.07 gpt Au, while the steeper DV18-07B cut 10.00 metres of 3.10 gpt Au, including 6.25 metres of 4.90 gpt Au, and 4.00 metres of 7.42 gpt Au (Figure 2). Step-out drilling 65 metres north of DV18-06 intersected a new shallow occurrence of mineralized quartz veins in metasedimentary rocks along the projected extension of the deposit and continued to track the north plunging Main Zone to depth. Hole DV18-08 intersected a new occurrence 90 metres below surface, returning 17.50 metres of 5.81 gpt Au, including 9.25 metres of 9.65 gpt Au, and 4.75 metres of 18.12 gpt Au (Figure 2). This represents a new high-grade discovery at Diversified, and opens the deposit to the north, an area the Company intends to pursue in upcoming drill programs. Hole DV18-08B extended the Main Zone to depth well north of previous drilling, returning 7.75 metres of 3.66 gpt Au, including 5.50 metres of 5.05 gpt Au, and 2.50 metres of 10.65 gpt Au. The Number 3 showing lies along the LAFZ, 450 metres south of the Diversified shaft and 800 metres north of the East Zone at North Inca (Figure 1). In 2011 Nighthawk drilled seven holes (1,954 metres) to explore the deposit laterally and to depth. The campaign proved successful, intersecting considerably higher grades and greater widths than previously reported from historical drilling, and extended near surface mineralization to more than 200 metres depth (see press releases dated September 6, 2011; and November 21, 2011). In the current program, six holes (1,294 metres) were drilled to follow up on the 2011 results, of which DV318-01 and DV318-01B lengthened the down plunge extension of shallow mineralization in the central part of the deposit to 90 metres in depth. A second series of holes, collared 50 metres south of DV318-01, tracked near surface mineralization down plunge, with holes DV318-02 and DV318-02B extending mineralization southward and encountered a new area 40 metres below surface that returned 10.00 metres of 2.67 gpt Au, including 6.75 metres of 3.54 gpt Au, and 3.00 metres of 6.09 gpt Au. The Number 3 showing is largely unexplored but continues to deliver significant intercepts, illustrating the vast exploration opportunities that exist. The Lexindin showing is located 1.2 kilometres north of the Diversified shaft (Figure 1). Tensional, en-echelon, quartz veins lying oblique to branches of the main shear zone represent the mineralized zones at Lexindin. Mineralization is reported to plunge steeply to the north and appears to open-up laterally with increased depth. Historical drilling was limited to shallow depths with reported intersections of 113.80 g/t Au over 3.05 metres, 18.85 g/t Au over 1.53 metres, and 22.97 g/t Au over 2.37 metres, indicating its potential. In 2011 Nighthawk drilled a single hole to test shallow targets and intersected weak mineralization (see press release dated November 21, 2011). In 2018 the Company drilled two holes (429 metres) to gain a better understanding of the target's geological setting and growth potential. Holes LX18-01 and LX18-01B were drilled 60 metres south of Nighthawk's 2011 hole to validate the down plunge southern extension of the mineralized model. The steeper hole, LX18-01B, intersected a broad new gold occurrence that assayed 21.80 metres of 1.20 gpt Au, including 8.65 metres of 2.03 gpt Au, and 3.65 metres of 2.93 gpt Au. This new discovery lies 120 metres below surface and 40 metres east of the current model, illustrating the exceptional exploration potential of this mineralized system. Lexindin is the least explored and poorest understood of the four Leta Arm prospects. Additional drilling is required to fully assess the opportunities present and to determine if mineralization can be expanded and traced south towards the Diversified mine. The Company has recently received the results of a ground Induced Polarization geophysical survey over the area between North Inca, #3 and Diversified, and is currently processing the data. That information will be used to help better explore to depth and along strike, and to determine if they share a common link. Leta Arm remains a primary focus for Nighthawk and is one of its key regional assets. Dr. Michael J. Byron, Ph.D., P.Geo., President & Chief Executive Officer of Nighthawk, who is the "Qualified Person" as defined by NI 43-101 for this project, has reviewed and approved of the technical disclosure contained in this press release. Neither the Toronto Stock Exchange has neither reviewed nor accepts responsibility for the adequacy or accuracy of this press release. This press release contains "forward-looking information" within the meaning of applicable Canadian securities legislation. Forward-looking information includes, but is not limited to, information with respect to: any possible relationship between the four deposits at Leta arm; the Company's exploration programs including drilling, and the timing and results thereof; and any potential for future production at Colomac. Generally, forward-looking information can be identified by the use of forward-looking terminology such as "plans", "expects", or "does not expect", "is expected", "budget", "scheduled", "estimates", "forecasts", "intends", "anticipates", or "does not anticipate", or "believes" or variations of such words and phrases or state that certain actions, events or results "may", "could", "would", "might", or "will be taken", "occur", or "be achieved".